The Seventh Annual Center City Jazz Festival features a lineup of blockbuster performers on Saturday, April 28, 2018 as part of Philadelphia Jazz Appreciation Month. Attendees can expect a jam-packed schedule of 20 bands performing at five venues over six hours, all within walking distance of each other in the heart of Center City. BIGYUKI, Marcus Strickland's Twi-Life Delta, Sharel Cassity, Leon Jordan Jr., Lena Seikaly, Ken Fowser, and many more. One ticket provides access to all performances. The list of scheduled performers is availble online at www.CCJazzFest.com. 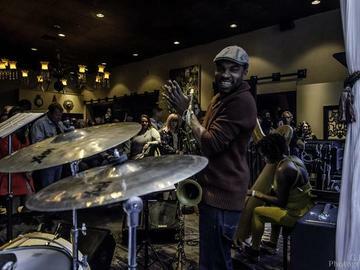 The inaugural 2012 Center City Jazz Festival took place in April 2012 and featured 17 original bands from the Philadelphia and NYC areas. Hundreds of jazz lovers came out for an exhilarating day of great music. The bands performed in four packed venues which were all centrally located in downtown Philadelphia and within a short walking distance of each other. Venues included Time Restaurant, Chris' Jazz Cafe, Fergie's Pub, and Milkboy Philadelphia. The 2012 Festival was made possible through an innovative Kickstarter campaign, during which nearly 200 individuals contributed.